On October 10, the student visited us as part of the educational activity, “Metropolitan District Fieldwork”, a Kaichi High School research activity. The student toured the Japan Center for International Cooperation in Conservation, focusing on World Heritage as the subject of study “World Heritage”. The person in charge of the facility provided explanations and answered questions. 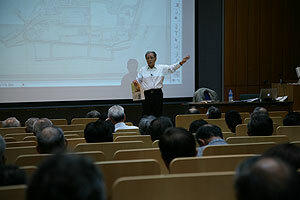 On October 8 and 9, 2008, a public lecture was held in the basement seminar room of the Institute. Both presentations on the first day were related to the topic of the search for the origin of Buddhist art: Katsuki Gen’ichiro of the Department of Research Programming spoke on “the search for the origin of Hāritī (the protector of children),” and Nakagawara Ikuko of the Nagoya University on “the donors depicted in the cave temples of Kucha region and their religion.” On the following day, Tanaka Atsushi of the Department of Research Programming gave a lecture on “artists in photographs, with focus on Kuroda Seiki” in which he considered a artist’s creations and lives based on photographs. Aoki Shigeru of Bunsei University of Art spoke about “the year 10 of the Meiji era: the Seinan War and the Map of Ueno Park” in which he traced the course of the history of Ueno based on the Ueno Park Survey Map, a copperplate engraving. The number of attendees was 150 on the first day and 127 on the second day. Responses to questionnaires showed that the presentations were well received. As mentioned in the monthly report of last July, October 9 we started to exhibit the “Lakeside” painted (in 1993) by Fukuda Miran, a contemporary artist, in Tokyo National Museum’s Kuroda Memorial Hall. This exhibition was in conjunction with the international symposium, Capturing the Original: Archives for Cultural Properties that will be held on December 6 – 8. This exhibit will continue until December 25. This event, entitled Lakeside Versus Lakeside, exhibits the work Fukuda Miran created based on Lakeside, the representative work Kuroda Seiki, a western painter in Meiji era, along with the original, which is in the permanent exhibition in Kuroda Memorial Hall. Fukuda Miran – a spirited contemporary artist – creates works using the fine arts of all ages and cultures as base materials, and is known for his creative activities that shake up the original images. Fukuda’s Lakeside extends the background of Kuroda’s Lakeside for painting, possibly upsetting the image of the celebrated picture that is so familiar in schoolbooks and stamps. 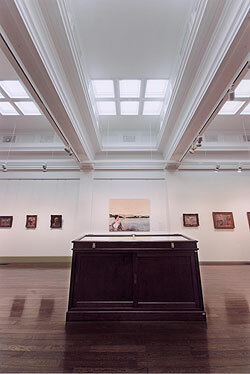 It also prompts viewers to look at the original work from a new angle. Visitors looked puzzled, but nevertheless seemed to enjoy the contrast of Kuroda’s Lakeside and Fukuda’s Lakeside, which are exhibited facing each other across the hallway. On October 8, we held an internal workshop at the Department of Research Programming with an eye toward the international symposium with the presentation of Mr. Morishita Masaaki, a visiting researcher of the Institute. In the presentation Issues Surrounding Art Museums and Originals: Contemporary Art, Mr. Morishita introduced activities which surpass the artwork concept of objects produced by traditional artists, mainly focusing on contemporary art in England. It highlighted one issue of contemporary museums: how those activities are to be conveyed. While the works tend to be abstracted, we are deeply interested in the activities of the International Network for the Conservation of Contemporary Art (INCCA), which attempts to showcase the contemporary scene, particularly by recording interviews with writers and others as contemporary models for conserving works of art. Based on the agreement for research exchange between Japan and Korea on the conservation of intangible cultural heritage, which was signed last June with the Folkloric Studies Division of the National Research Institute of Cultural Heritage of Korea, Hyoki Satoru of the Department of Intangible Cultural Heritage researched visual documents of intangible cultural heritage in South Korea for two weeks in October 2008. The purpose was to investigate the current condition of such visual documents and apply the results of this research to the management and utilization of similar documents in Japan. In South Korea, the National Research Institute of Cultural Heritage actively creates visual documents of intangible cultural heritage and manages them in cooperation with various organizations including the National Archives of Korea and the Korean Film Archive. There are many points to be learned from this organizational management system. For example, the active use of visual documents made by the Institute in television broadcasting was quite impressive. The Department of Intangible Cultural Heritage is now creating a database of locations of visual documents on Japanese intangible cultural heritage and would like to consider sharing information with Korea. 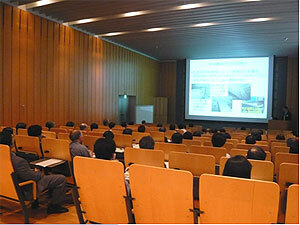 On October 6, 2008, the Center for Conservation Science and Restoration Techniques held a seminar as part of its research on controlling bio-deterioration of cultural heritage. The topic of the seminar, which was attended by 79 persons, was the maintenance of outdoor wooden cultural properties and issues for the future. Mr. Kanda Masaaki of the Nara Prefecture Board of Education spoke on the recent issues of biological damage in managing structures, such as temples and shrines, and carved wooden statues. Dr. Fujii Yoshihisa, a visiting researcher of the Institute from Kyoto University, accurately pointed out issues concerning deterioration diagnosis and maintenance systems for cultural property buildings. Ms. Honda Mitsuko of the Kyushu National Museum spoke on what should be done when exhibiting cultural properties outdoors and when storing them in museums. Dr. Kawakami Nobuyuki, an architect, gave a talk on the current condition and issues concerning the maintenance and management of restored buildings dating to the Yayoi period, using the Yoshinogari site as an example. This was followed by an in-depth discussion. There are numerous issues to be dealt with in conserving outdoor wooden cultural properties and specific measures will be studied in the project. Ms. Sato Kyoko, currently finishing a master’s course in conservation science at Tokyo Gakugei University’s Graduate School, and Ms. Kurahashi Emi, currently finishing a master’s course in Japanese-style painting at Tsukuba University’s Graduate School, went to the Dunhuang Academy on June 1, finished their training, and returned to Japan on October 19 without incident. 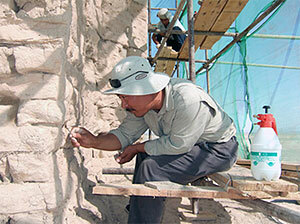 The two trainees stayed in the hotel at Mogao Grottoes, and with the full cooperation of Dunhuang Academy, they received detailed training concerning the protection of cultural properties, the restoration of murals – on-site survey, analysis and research, practical conservation processes, and mural structure reproduction and copy – as well as a lecture on management and operation of Mogao Grottoes, a world heritage site. In terms of research topics, Ms. Sato performed analysis and comparative study on red coloring matter used for the murals, and Ms. Kurahashi analyzed the restoration copy for scientific study. Their studies gained high marks from the researchers of the Dunhuang Academy at the final presentations. The encounter and interaction with colleagues of the same generation at the Dunhuang Academy will likely have a great influence on their future, along with the valuable experiences they had at the local site. This training will be held for two more years. The training for the third year of the earthen structures conservation group in the project for capacity development along the Silk Road was jointly conducted with the National Institute of Cultural Properties of China at Guazhou, Gansu province for 2 months from September 1, 2008. A completion ceremony was held on October 31 to mark the end of a training that took place for a total of 7 months over 3 years. Earthen structures include buildings above ground built by piling mud bricks and sites unearthed during archeological excavations. In Japan there are many examples of archeological sites that have been conserved but, since there are few buildings above ground made of dried earth alone, Japan lacks experience in the conservation of such buildings. These sites that remain in various locations along the Silk Road from West Asia to China are like landmarks of the movement of the culture of the west to Japan, on the east end of the Silk Road. For this reason, it is significant in terms of cooperation to foster human resources to protect these sites. Until now, Japanese specialists have continued to cooperate in conservation activities in Iran and other countries in Central Asia. 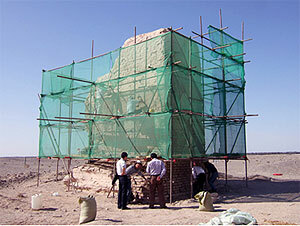 In this particular training, conservation techniques were applied to the earthen gate pillars of graves built in the Gobi Desert of Guazhou some 2,000 years ago. The 12 trainees freely used the concepts and theories they learned through their training during the past 29 months to consider the most appropriate method for the conservation of the site based on on-site investigation and observation. They also conducted the actual conservation work. In addition, they compiled a report that summarizes their three-year training. It is hoped that they will return to their respective areas and engage in conservation of earthen structures as local leaders. The Japan Center for International Cooperation in Conservation has been participating in the UNESCO/Japanese Funds-in-Trust project, “Preservation of the Buddhist Monastery of Ajina Tepa, Tajikistan” since 2006. As this is the last year of the project, the excavated objects were sorted and the acquired data were analyzed in view of the publication of a report at the National Museum of Antiquities of Tajikistan from October 2 to 23, 2008. Most of the excavated objects are fragments of pottery and mud bricks from the 7th to 8th centuries when people inhabited the Ajina Tepa site. In this mission, a piece of the rim of a large jar on which stamp seals had been impressed was found among these objects. There are two seal impressions, one large and the other small. 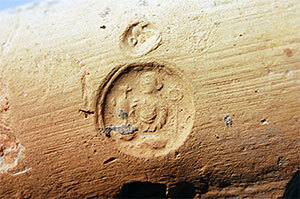 At the center of the large round seal is an image of a seated figure; to its right, as viewed from the image, is a water pot, while to its left is an object that looks like a staff. Although many fragments of large jars have been discovered from the Ajina Tepa site, this is the only piece with such seal impressions. Had the seals been impressed on large jars used for a special purpose? This was a fascinating finding.